For more information about this event, please contact Cirque Éloize at eloize@cirque-eloize.com. 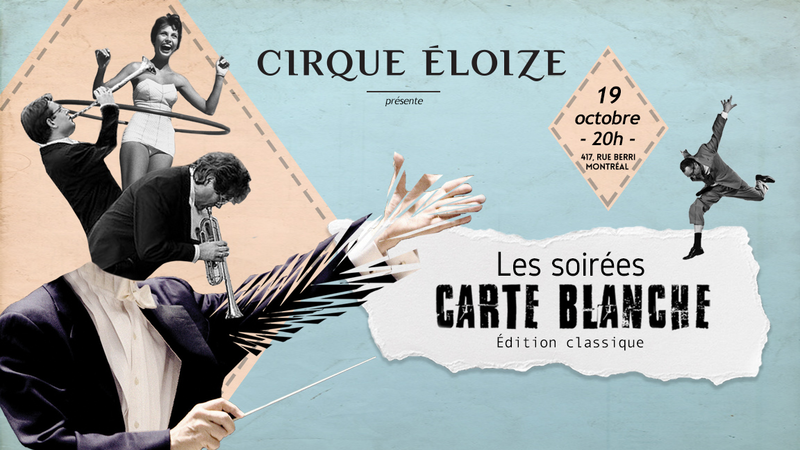 On Thursday, October 19th, Cirque Éloize opens its doors to the city for the second edition of the Soirées Carte Blanche, an event that welcomes spectators to explore raw performances and the unique and unusual encounter of circus arts and classical music. Eleven daring artists will take part in this exciting evening. Some of them will present you their extravagant and wildly eccentric numbers while other will surprise you with their astonishingly simple but beautiful act. Join us in the Cirque Éloize’s living room for this unique and extraordinary evening. Et d’autres à venir/And more to come! **La totalité des recettes de la billetterie sera remise aux artistes / All the ticket sale revenue will be distributed to the artists.